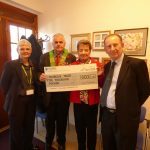 Foresters Friendly Society donate £5,000 to Hamelin Trust! The Foresters Friendly Society have very kindly donated £5,000 to Hamelin Trust. We were honoured to have Richard Bourne, Catherine Ramsay and Alan Giffen from the Billericay Branch visit Day Opportunities. We were more than happy to show them round and let them see the wonderful projects within Day Opportunities. The Foresters have very kindly donated £5,000 to Hamelin Trust which Julie Fuller, CEO, gratefully received from them. We are hoping to put this towards expanding Day Opportunities so we can help meet the needs of even more people. We would like to say a massive thank you to The Foresters for their very kind donation and for thinking of Hamelin Trust.